Hey Guys! 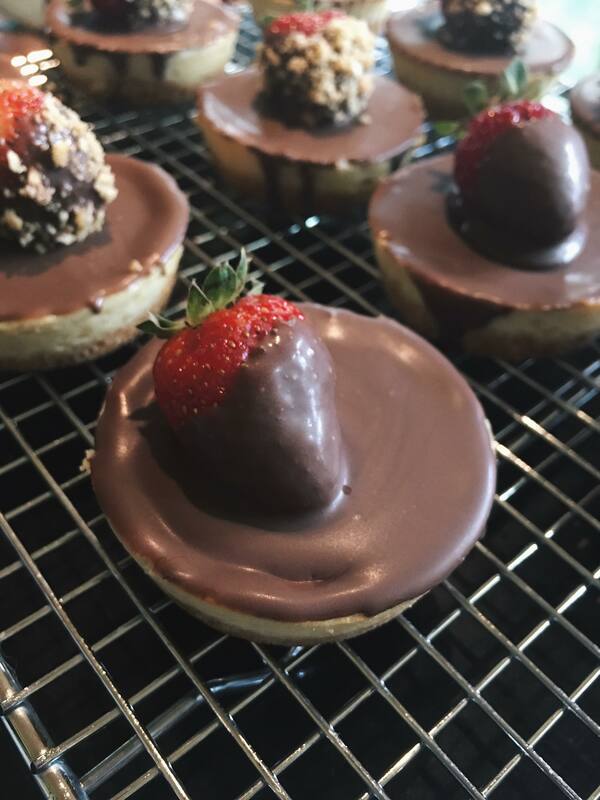 This week I decided to share with you how to make these bite sized, Choc Covered Strawberry Cheesecakes. They are super yummy and easy to make. Perfect for Valentines Day! Preheat your oven to 180 degrees Celsius. Line your muffin tray with liners, I used silicone cupcake liners. While the base of your cheesecake is setting, use an electric beater to beat the cream cheese, sugar, vanilla and lemon juice together. Once combined add your eggs one at a time and beat until you have a smooth and creamy mixture. Spoon your cheesecake mixture into the molds, then place your cheesecakes into the oven for 20 minutes. Or until risen slightly and beginning to crack on the surface. Allow your cheesecakes to cool in the trays completely and then place them in the fridge for 1 hour to set. Once your cheesecakes have set completely, remove them from your liners. Spoon your melted chocolate over each individual cheesecake. Then dip each strawberry into the melted chocolate to cover them and then place on top of your cheesecakes. You can also sprinkle your extra crumb mixture onto the chocolate covered strawberry, before placing it on the cheese cake to add a nice crunch.